So we are trying to force Mum to get her lazy bum online and do some more blogging, we would take it upon ourselves, but we lack opposable thumbs..and a computer. But anyway we have had a busy busy week, but before I tell you about adventures, Dante would like a word. Hello Everyone...Dante here, now look at this photo, aren't I having fun? that was me, before my STUPID little brother decided to jump on me when we were at the beach. He hurt my back leg, and it hurt- alot! I have damaged my hip and I'm not allowed to go on any walks for a while, I have to go to the V-E-T soon for X-rays, they mentioned something about early affects of hip-dysplasia. Mum was very upset but I was a very brave boy. It seems to be working! 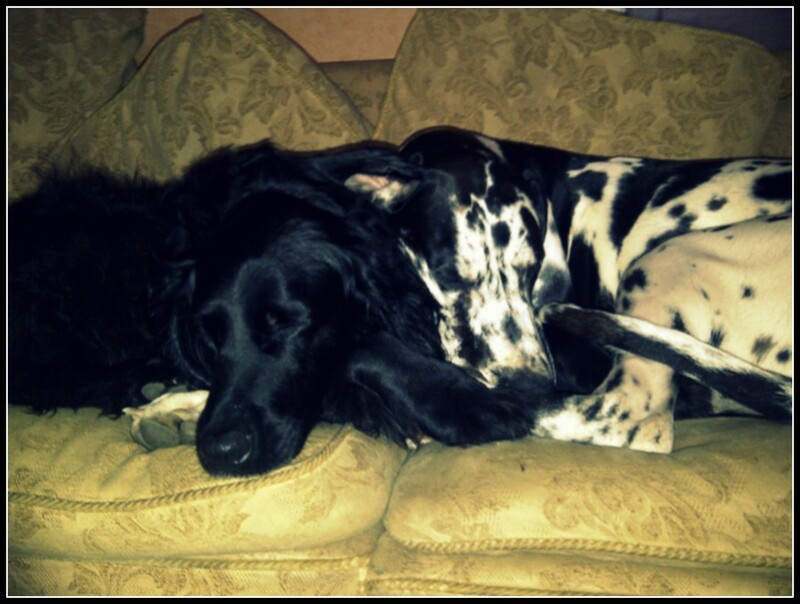 So while I've been stuck at home sulking, Sampson and Daisy-Boo have been having fun, I'll let them tell you. Quickly moving on now.......I just turned 10 months last week, so Mum decided now I'm getting bigger I could go on a small hike with her and Daisy-Boo. She took us to one of her favourite places to hike, not too far from our house, a place called High Dam. It's not a very long walk but it is very pretty. It's very quite this time of year and Mum didn't see a soul the entire walk, so come on then lets go! Daisy-Boo was nice and clean at the start of our walk...see all prim and proper. Hey Sampson, come and eat this grass, it tastes great! Unfortunately for us we had the zoomies in a marsh...it didn't look like a marsh to us, but soon we both fell in a huge muddy pool, Mum found it hilarious....look at poor Daisy-Boo! Then Daisy-Boo made herself even more messy by rolling in the ferns. Then our walk was cut short when we came across a 'kissing gate' Mum had to open it and slide us through to the other side, I was just big enough to fit through, shes worried about when I'm fully grown I won't fit!! We had walked and walked until we finally reached the Tarn at the top, so we could go swimming, hooray!! Mum wanted to get us in the water so we could clean ourselves off and git rid of all the marsh dirt. Daisy-Boo jumped in no problem (must be all the water dog in her) but me...I'm not going to lie, I was a bit too cold to go for a swim, So I waited for unsuspecting Daisy-Boo to get out..
On the way back we found this neat bridge where Daisy-Boo waited for me to cross with her. Mum tried to get one good shot of us both posing, but we were being very un-photogenic and rubbish! Mum, get that thing out of our faces! Now! It was starting to get dark early because it was such a dull day (it didn't rain though- hooray!) so we decided to take the short cut back to the car, which only takes about 10 mins, so I have no idea why Mum took us the long way to start with....she is a strange lady. Annnd then finally back to the car! I was so sleepy I was asleep before Mum had even shut the door. Daisy-Boo stayed awake to help Mum out of the car park and back to the main road till she fell asleep herself. We did miss Dante loads though, I feel so bad for hurting him! Sorry Bro, Love you lots! Hello everyone, we hope you all had a great Valentines Day! 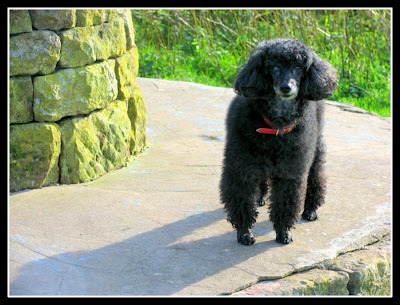 Sampson and Daisy-Boo didn't get dates, Mum says its because they are too young, but I on the other hand got myself a date with a stunning older lady, Rosie the poodle. Isn't she gorgeous? She belongs to Mums very good friend and Mum says she has know Rosie for nearly 11 years! I think we make a very good couple, don't you? Anyway, we have to give a big thanks to Haopee (please go visit her amazing blog!) 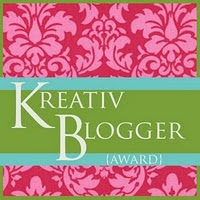 who has both tagged and given us an award. Now I'm required to say something creative about us and Mum...now that is a tough one! 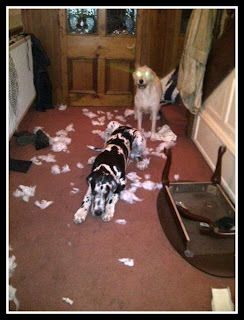 1.Sampson and Daisy-Boo like to take it upon themselves to do a bit of interior decoration from time to time.. Apologies for the photo quality, Mum only had her mobile at the time . 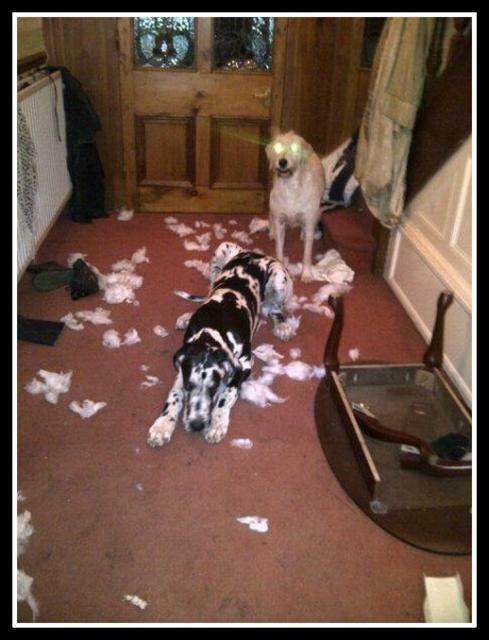 and yes that is a shredded blanket, clean washing all over the floor and a very broken coffee table! and go get your ball. She's trying to teach us to clean up our toys when we are done...we don't seem to be very good at that one though, BOL! 4. Mum volunteers at the local kennels as a dog walker. 5. She's had many different pets too, along with us doggies she has had rabbits, guinea pigs, hamsters, gerbils, fish, giant snails, a horse then even a pigeon or two! Dante: Lazy, clumsy, placid, patient, happy, lovable and constantly waggly. Daisy-Boo: Bossy, talkative, sensitive, shy, scruffy, protective and smart. 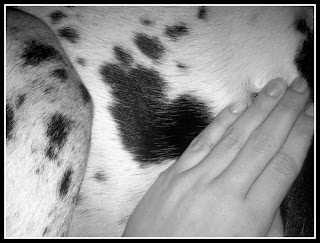 Sampson: Lanky, uncoordinated, in the way all the time, cuddly, Mummy's boy, clown and bouncy. Dante: Nothing I could sleep forever, Sampson does annoy me when he jumps on me in the morning. Daisy-Boo: Everything..oh what is that? Who's there? There's some one outside, everyone wake up! Sampson: When I forget how big I am and I roll and fall of the bed, ouch! Dante: Do I have to do more things if I am someone else?....that sounds like too much effort for me. Daisy-Boo: Still me, but with less facial hair. Sampson: Oooh..erm..Superman...or Underdog, no wait, Batman! Dante: My massive fur coat...although I could say I'm in the buff. Daisy-Boo: Ooh erm... awkward..but I'm naked right now. Dante: Not much, I'm quite a chilled out dude. Daisy-Boo: The world in general, argh is that a hoover?! Is that something being dropped on the floor? Eeee! Sampson: When Mum leaves the house, don't be gone too long! 6. The best and worst parts of blogging. The Gang: The best part is definitely meeting all our new friends, the worst part is trying to find the time to get round everyone's blogs. 7.The last website I visited. 8.What is the one thing you would change about yourself? Dante: Change? Would that be a lot of effort? Daisy-Boo: My beardy face :( and maybe I would like to be not as much as a scared-y cat as I am! Sampson: I do wish I had a little more coordination. The Gang: Can we play with it?! 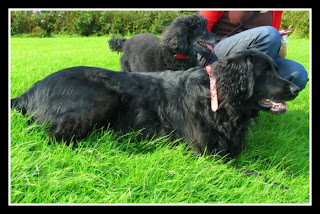 mydogslove.me is such a great blog her posts are always full of life, varied and such a blast to read. We are so glad we found her blog! We tag anyone who fancy doing it! Mum has to apologies, she is trying to get round everyone's blogs, but there doesn't seem to be enough hours in the weeks lately, don't worry she will though. Oh ha, very funny- now put it away young lady! Look forward to catching up on your adventures!